There are many ways you can support Arts Law and the work we do for artists and the arts community of Australia. When you support Arts Law it means we can support Australia's artists. Empowering artists is at the heart of what we do. We stand up for artists’ rights, make sure that Aboriginal and Torres Strait Islander artists are respected wherever their art is seen in Australia and we are on the front line of providing legal advice to creators all around the country. By contributing to Arts Law you recognise the importance of artists and art to our lives. Please consider making a tax deductible donation to Arts Law today. Assist us by volunteering as a panel lawyer, note-taker or daytime volunteer. Increasingly Arts Law needs your financial support to continue providing access to legal advice and resources for artists in Australia. You can meet some of the artists we have helped over the years and see the impact we've had on their lives. Make a Donation today. 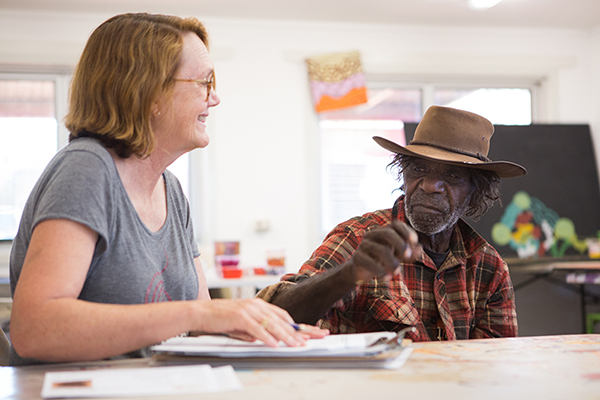 The Adopt a Lawyer pro bono program partners Aboriginal and Torres Strait Islander community arts centres with an experienced law firm for a period of three years, fostering partnerships that enable art centres to secure greater access to legal advice as well as building a closer relationship between law firms and Australia’s ancient Indigenous culture. Learn more about this great program and how to get involved.